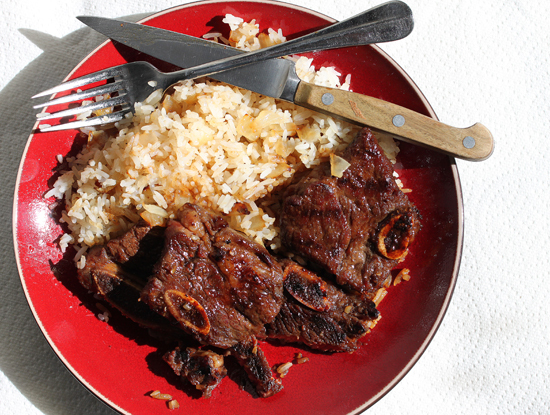 When I was at the market the other day, I saw some Flanken Style Short Ribs in the meat case. I was thinking about how I have been touting myself as this stone carnivore and I don’t have one meat dish in my recipe index yet. So I bought the long, thin cross-cut ribs and decided to marinate them in a Korean-style Bulgogi sauce and cook them on my grill pan. I was really looking forward to the taste of the sweet-salty grilled beef for my lunch. 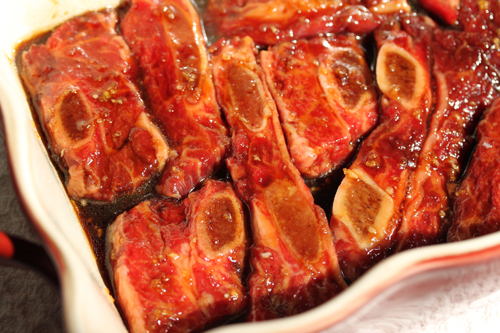 This marinade can be used for any beef cuts you are planning to grill, either on a grill pan or outdoor barbeque. I have marinated thin slices of steak on bamboo skewers and then grilled them either for an appetizer or main dish. I have never used it for chicken, but I bet it would work for that, too. Summer is coming and this is a great recipe to have on hand. Today I also wanted to use up some leftover rice (I LOVE leftovers) from Thai take-out that I had in my freezer. I chopped up half an onion and sautéed it in some butter until it started to brown and was soft. Then I added the thawed-out rice and stir fried until it was heated through. A little salt and pepper and it was done. There is something so wonderful that happens when you cook onions in butter. They sizzle and get soft and sweet. So good. 2. Add the beef to coat. Marinate for up to 30 minutes. Reserve marinade. 3. Cook on grill pan, barbeque or stir-fry over high heat. 4. Cook until desired doneness or temperature. Serve with rice and veggies. Drizzle with reserved marinade if desired.